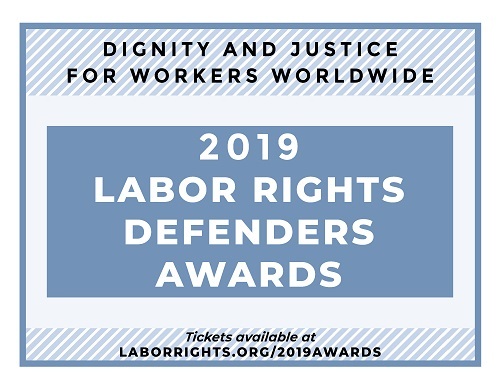 Our awards ceremony brings together policy leaders, labor activists and an increasingly diverse group of internationalists who know that human rights and economic justice depend on the ability of workers and their advocates to speak out and defend human rights at work. We honor trailblazers, both nationally and internationally, for their innovation and visionary leadership in labor rights advocacy, from fighting for safe and just working conditions to demanding corporate accountability. Each ticket is $175. The amount of your donation above $70 per ticket is tax-deductible. Donation Amount: First Name: Last Name: Organization/Affiliation: Email: Mobile Phone: Address: City: State: Alabama Alaska Arizona Arkansas California Colorado Connecticut Delaware District of Columbia Florida Georgia Hawaii Idaho Illinois Indiana Iowa Kansas Kentucky Louisiana Maine Maryland Massachusetts Michigan Minnesota Mississippi Missouri Montana Nebraska Nevada New Hampshire New Jersey New Mexico New York North Carolina North Dakota Ohio Oklahoma Oregon Pennsylvania Rhode Island South Carolina South Dakota Tennessee Texas Utah Vermont Virginia Washington West Virginia Wisconsin Wyoming American Samoa Federated States of Micronesia Guam Marshall Islands Northern Mariana Islands Palau Puerto Rico U.S. Minor Outlying Islands Virgin Islands Armed Forces Americas Armed Forces Europe, the Middle East, an Armed Forces Pacific Alberta British Columbia Manitoba New Brunswick Newfoundland and Labrador Nova Scotia Northwest Territories Nunavat Territory Ontario Prince Edward Island Quebec Saskatchewan Yukon Territory Zip Code: - Country: United States of America (the) Canada Afghanistan Åland Islands Albania Algeria American Samoa Andorra Angola Anguilla Antarctica Antigua and Barbuda Argentina Armenia Aruba Australia Austria Azerbaijan Bahamas (the) Bahrain Bangladesh Barbados Belarus Belgium Belize Benin Bermuda Bhutan Bolivia (Plurinational State of) Bonaire, Sint Eustatius and Saba Bosnia and Herzegovina Botswana Bouvet Island Brazil British Indian Ocean Territory (the) Brunei Darussalam Bulgaria Burkina Faso Burundi Cabo Verde Cambodia Cameroon Cayman Islands (the) Central African Republic (the) Chad Chile China Christmas Island Cocos (Keeling) Islands (the) Colombia Comoros (the) Congo (the Democratic Republic of the) Congo (the) Cook Islands (the) Costa Rica Côte d'Ivoire Croatia Cuba Curaçao Cyprus Czechia Denmark Djibouti Dominica Dominican Republic (the) Ecuador Egypt El Salvador Equatorial Guinea Eritrea Estonia Ethiopia Falkland Islands (the) [Malvinas] Faroe Islands (the) Fiji Finland France French Guiana French Polynesia French Southern Territories (the) Gabon Gambia (the) Georgia Germany Ghana Gibraltar Greece Greenland Grenada Guadeloupe Guam Guatemala Guernsey Guinea Guinea-Bissau Guyana Haiti Heard Island and McDonald Islands Holy See (the) Honduras Hong Kong Hungary Iceland India Indonesia Iran (Islamic Republic of) Iraq Ireland Isle of Man Israel Italy Jamaica Japan Jersey Jordan Kazakhstan Kenya Kiribati Korea (the Democratic People's Republic of) Korea (the Republic of) Kuwait Kyrgyzstan Lao People's Democratic Republic (the) Latvia Lebanon Lesotho Liberia Libya Liechtenstein Lithuania Luxembourg Macao Macedonia (the former Yugoslav Republic of) Madagascar Malawi Malaysia Maldives Mali Malta Marshall Islands (the) Martinique Mauritania Mauritius Mayotte Mexico Micronesia (Federated States of) Moldova (the Republic of) Monaco Mongolia Montenegro Montserrat Morocco Mozambique Myanmar Namibia Nauru Nepal Netherlands (the) New Caledonia New Zealand Nicaragua Niger (the) Nigeria Niue Norfolk Island Northern Mariana Islands (the) Norway Oman Pakistan Palau Palestine, State of Panama Papua New Guinea Paraguay Peru Philippines (the) Pitcairn Poland Portugal Puerto Rico Qatar Réunion Romania Russian Federation (the) Rwanda Saint Barthélemy Saint Helena, Ascension and Tristan da Cunha Saint Kitts and Nevis Saint Lucia Saint Martin (French part) Saint Pierre and Miquelon Saint Vincent and the Grenadines Samoa San Marino Sao Tome and Principe Saudi Arabia Senegal Serbia Seychelles Sierra Leone Singapore Sint Maarten (Dutch part) Slovakia Slovenia Solomon Islands Somalia South Africa South Georgia and the South Sandwich Islands South Sudan Spain Sri Lanka Sudan (the) Suriname Svalbard and Jan Mayen Swaziland Sweden Switzerland Syrian Arab Republic Taiwan (Province of China) Tajikistan Tanzania, United Republic of Thailand Timor-Leste Togo Tokelau Tonga Trinidad and Tobago Tunisia Turkey Turkmenistan Turks and Caicos Islands (the) Tuvalu Uganda Ukraine United Arab Emirates (the) United Kingdom of Great Britain and Northern Ireland (the) United States Minor Outlying Islands (the) Uruguay Uzbekistan Vanuatu Venezuela (Bolivarian Republic of) Viet Nam Virgin Islands (British) Virgin Islands (U.S.) Wallis and Futuna Western Sahara* Yemen Zambia Zimbabwe Anonymous: No Yes Please indicate the names of your guests if you are purchasing more than one ticket. By providing your mobile phone number, you agree to receive occasional text messages from ILRF and you can unsubscribe at any time. Message and data rates may apply. If you would like to manage your account (i.e., view donation history, change address, etc. ), please create a login name and password. If you are donating from outside of the U.S., please use the "PayPal" option on the next screen. ILRF is a 501(c)(3) non-profit organization. In accordance with IRS regulations, we acknowledge that no goods or services are provided in exchange for your contribution. Contributions are tax-deductible to the extent allowed by law.